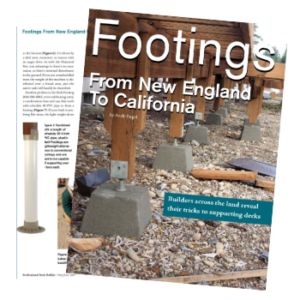 Here’s where you can read some of the documentation about Redi-Footing, including a link to the installation instructions and the science behind our deck and shed footings. The engineering test was completed in 2002 by Geisser Engineering Corporation and RediFooting has been used to build thousands of decks, sheds and other outdoor projects since. The results of the Engineering test is what you may need to provide to your building inspector. If you have any questions please contact us here. This is the engineering documentation you may need to provide to your local building inspectors if requested. Redi-Footing has been thoroughly tested and has been used in the construction industry for over 15 years. Geisser Engineering Corporation performed the required testing and the attached documentation shows the testing results and proof of durability and strength. Read the engineering test results here. 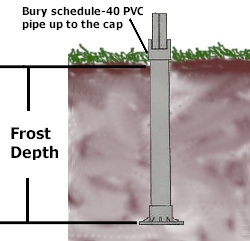 This drawing shows the details of standard deck construction using Redi-Footings for the footings. Step-by step instructions by contractor Mike Guertin, with photos showing you how fast and easy it is to assemble each Redi-footing and start building your structure. Learn more about Redi Footing or place your order here. 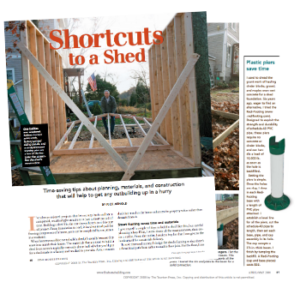 Fine Homebuilding shows how to build a shed using RediFooting for your shed project. Featured in Professional Deck Builder magazine as a featured alternative to concrete footings.